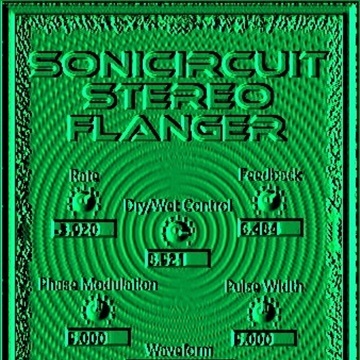 http://syntheway.com/Sonicircuit_Stereo_Flanger.htm - Sonicircuit Stereo Flanger is an effect plugin that creates a mixing of two identical signals together, one signal delayed by a small and gradually changing period, causing a ‘phase shift´ between the two signals. The length of this pause is gradually varied over time resulting in a ‘sweeping´ effect, delivering from subtle nuances to extreme jet engine taking off. Primarily intended for use with guitar, vocals and synths, this virtual effects unit is versatile and intuitive to create new and unique textures. Available in VST (32 and 64-bit) and VST3 (64-bit). - A vast array of modulated tones that includes classic flanger as well as futuristic and chunky swirling sounds. From slow whooshes to rippling wobbles, from slow to fast space ray gun effects or from subtle textures to warped sound of a starting jet engine. - 16 Presets included. Ability to create new and interesting spacey, metallic or underwater quality to input signals. - Rhythmic flange effect, similar to an arpeggiator or sequencer, by emphasizing notes through rate and feedback highest settings and 'pulse' waveform active. - Stereo inputs and outputs, which is really suitable where ultra-wide flange sounds are needed. Adds subtle to dramatic filtering effects and resonances to the sound, processing random “shifts” and “sweeps” in the frequency spectrum of original signal thus creating a sweeping, whooshing filter effect with a metallic, ringing sound. - Rate: Defines the frequency or speed of the oscillator. Turn the knob clockwise to increase the rate or counterclockwise to decrease the rate. - Feedback (Resonance, Regen): Determines the amount of the effect signal that is routed back into the input. This can change the tonal color and/or make the sweeping effect more pronounced. Higher settings yield a more dramatic effect. Many interesting tonalities such as bell tones, resonant pipes and robot voices sounds can be produced using high feedback values. Turn the knob clockwise to increase the rate or counterclockwise to decrease the regeneration. - Phase Modulation: Shifts the phase modulation. Spatial spread of the sound. - Waveform Combo Box: Shape of the modulating signal. A drop-down list to select different wave shapes: sine, saw, ramp, triangle and pulse plus white or pink noise. - Pulse Width Modulation: If the 'Pulse' waveform is selected, it control allows to set the 'Width' of rectangular pulse. Dry/Wet Control (Mixer): Determines the balance between dry (unprocessed) and wet (processed) signals. Turn this knob clockwise for more effect or counterclockwise for less effect. Flanger is not only for the guitar. Adding a bit of flange to your sound makes your guitar sound really unique. However, that is not the only thing that a flanger can be used for. Sonicircuit can also make great accompaniment when you use it in your post production. If you need to metalize certain sounds, then you could try using a hint of flange. You will get that awesome robotic sound as well as psychedelic textures for pads or vocals among others.